Named after its founder, the Swiss actor Rudolf Bernhard (1901-1962). 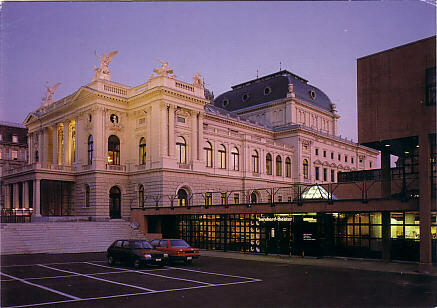 In the course of renovations of the adjacent Opernhaus, the old Esplanade building that had housed the Bernhard-Theater since its foundation in 1934 was demolished. 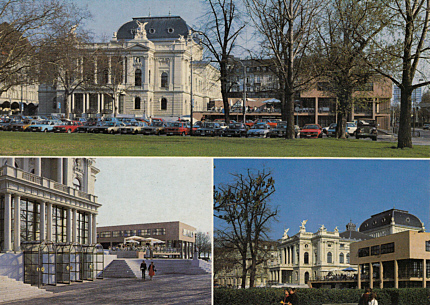 A new Bernhard-Theater was built on the old site from 1983-1984. Opened 27 Dec 1984 with Thornton Wilder's play "Our Town". Mainly used for dialect comedies, musicals and drama guest performances. 500 seats. Front Text: letters over entrance: "bernhard-theater"